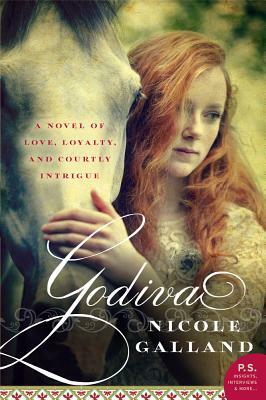 Godiva by Nicole Galland. It is a novel meant to entertain. It’s a light, quick, read about the intriguing Lady Godiva who has been legendary in English history. It’s light on historical facts, but with just enough historical detail to bring the times to life. I loved the simple way the introduction was written. It helped explain a complex history regarding the tax in elegantly simple prose. The book then opens with Godiva using her sexual prowess to put an end to a dispute between her husband and a neighboring lord. It tainted my expectations of Lady Godiva and made her seem more of a strumpet than a wise and strong wife. It also sent a warning bell ringing in my mind because it made me think the book would turn out to be like one of those all too common, inexpensive, bodice ripper romances. Lucikly, as the novel progresses, Lady Godiva is given a little more substance. The novel was not encumbered with too many characters, so it was easy to read. I liked that very much. It allowed me to relax into the story without having to struggle to keep track of who is who. Much to my delight, the author introduced only those characters integral to the story. My favorite subplot was that of Godiva’s friend, Abbess Egdiva and the troubles she got into. The brilliance of the book is the chapters that pertain to Lady Godiva’s naked ride. I thought that was writing at its very best, gripping, descriptive, emotional – it had it all. There are quite a few flaws in the historical details, but for those readers who are more into the story than the history of the times, this will not be a problem. All in all, this was an interesting novel, not one of my favorites by this author, but good all the same.